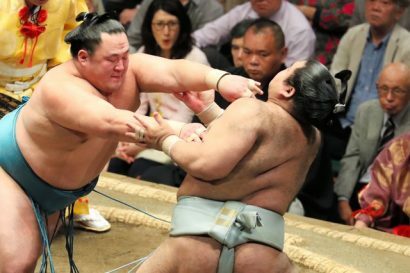 Dans un duel opposant deux sekiwake, Takayasu s’est incliné pour la première fois du tournoi face à Tamawashi. Le yokozuna Kisenosato a écrasé Daieisho pour rester deux victoires derrière les grands champions rivaux Hakuho et Harumafuji toujours invaincus. Sans doute sa victoire la plus convaincante du tournoi, Kisenosato a rapidement encerclé de ses deux bras Daieisho et l’aplati par abisetaoshi. Le maegashira 3 reste toujours sans victoire. Hakuho et Harumafuji ont tous deux facilement gagné et conservent la tête avec un score de 6-0. Le sekiwake Takayasu (5-1) a subi sa première défaite et se retrouve à égalité avec Daishomaru et Onosho. Takayasu, qui a été rapidement chassé du dohyô directement après la charge, doit gagner au moins cinq de ses neuf derniers matchs pour répondre au critère des 33 victoires nécessaires à la promotion au grade d’ôzeki. Hakuho, qui semble en bonne voie pour conquérir une 38e le titre, a donné une leçon de sumo au maegashira Endo (2-4). Hakuho a déclenché une avalanche de claques et de coups sur Endo qui a bien résisté jusqu’à ce que le mongol le projette hors de l’anneau avec un coup puissant. Harumafuji a frappé vigoureusement le maegashira 3 Aoiyama (1-5) pour le faire sortir de cercle. Terunofuji est sorti victorieux de sa rencontre avec le maegashira Chiyonokuni (1-5). Pour sa quatrième victoire, l’ôzeki a su garder son sang froid. Goeido a vaincu le komusubi Mitakeumi (3-3) par shitatenage mais l’ôzeki doit encore remporter quatre autres combats pour se mettre à l’abri d’une rétrogradation. Le komusubi Yoshikaze (4-2) s’est brillamment imposé face au sekiwake Kotoshogiku, condamnant au passage l’ancien ôzeki à une cinquième défaite. Yokozuna Kisenosato squashed Daieisho to stay within two wins of grand champion rivals Hakuho and Harumafuji at the Summer Grand Sumo Tournament on Friday. In arguably his most convincing win of the meet, Kisenosato quickly wrapped both arms around Daieisho and flattened the winless No. 3 maegashira with an abisetaoshi backward force down technique at Ryogoku Kokugikan. Hakuho and Harumafuji both won handsomely and share the lead at the 15-day event with perfect 6-0 records. Promotion-chasing sekiwake Takayasu suffered his first defeat and is in a tie for second place at 5-1 with rank-and-filers Daishomaru and Onosho. Hakuho, looking like a strong bet for a record-extending 38th career Emperor’s Cup after missing most of the last tournament with injuries, gave No. 1 maegashira Endo (2-4) a sumo lesson. Hakuho unleashed a barrage of slaps and thrusts that Endo did well to withstand until the Mongolian sent him flying out of the ring with a powerful shove. Harumafuji wrapped up the day’s action by knocking Bulgarian-born No. 3 maegashira Aoiyama (1-5) off the ridge for a comfortable force-out victory. Takayasu lost his share of the lead and saw his hopes of a shot at ozeki promotion take a hit with a comprehensive defeat to fellow sekiwake Tamawashi (4-2). Takayasu, who got rammed out of the ring straight after the charge, needs to win at least five of his last nine bouts to meet the criteria of 33 victories over three tournaments for promotion to sumo’s second-highest rank. In other bouts, Mongolian behemoth Terunofuji emerged victorious from a full-blooded encounter with top-ranked maegashira Chiyonokuni (1-5) for a fourth win. Goeido followed suit in the next bout, boosting his chances of ozeki survival by knocking komusubi Mitakeumi (3-3) about and setting himself up for a clinical shitatenage underarm throw. Goeido came into the tournament with the threat of demotion, but can secure his status with four more wins here. Komusubi Yoshikaze (4-2) returned to winning ways when he floored sekiwake Kotoshogiku with an under-shoulder swing down, sentencing the former ozeki to a fifth defeat.